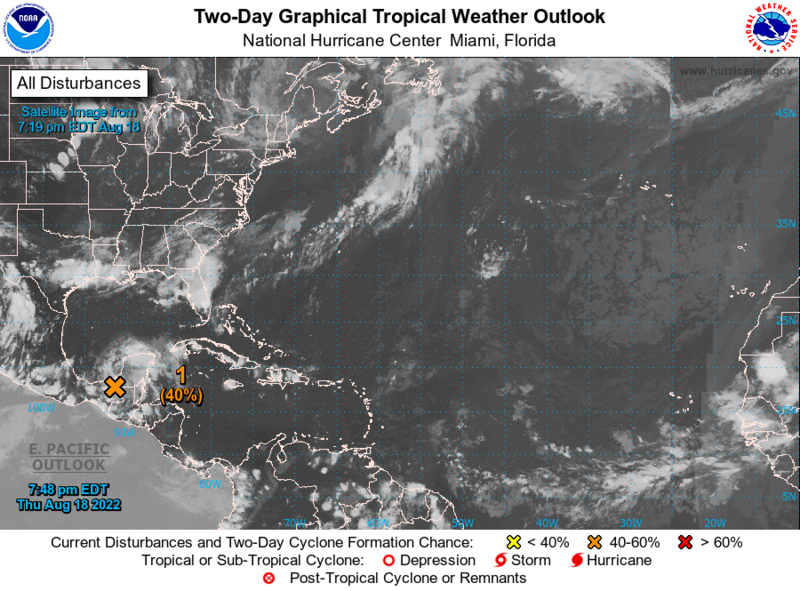 Today begins the hurricane season with a number of 12 storms, six hurricanes and 3 intense hurricanes according to data from the National Hurricane Center. It should be noted that hurricane season can be normal or out of normal all depending on the development of the El Niño phenomenon. ENSO-neutral persisted during April, with near-average sea surface temperatures (ssts) observed across the central equatorial Pacific and above-average ssts in the eastern Pacific [Fig. 1]. The latest child index values were + 0.5 ° C in the child-3 and child-3.4 regions, and + 0.3 and + 0.8 ° C in the child-4 and child-1 + 2 regions, respectively [Fig. 2]. The upper-ocean heat content anomaly was slightly positive during April [Fig. 3], reflecting the strengthening of above-average temperatures at depth around the date line [Fig. 4]. Atmospheric convection anomalies were weak over the central tropical Pacific and maritime continent [Fig. 5], while the lower-level and upper-level winds were near average over most of the tropical Pacific. Overall, the ocean and atmosphere system remains consistent with ENSO-neutral. Most models predict the onset of El Niño (3-month average child-3.4 index at or greater than 0.5 ° C) during the northern hemisphere summer [fig. 6]. However, the NCEP CFSv2 and most of the statistical models are more conservative and indicate that while child-3.4 index may be near or greater than + 0.5 ° C for several months, the warmth may not last long enough to qualify as an El Niño episode (5 consecutive overlapping seasons) and/or may not significantly impact the atmospheric circulation. Relative to last month, the forecaster consensus reflects slightly lower chances of El Niño (~ 45%), in part due to the conflicting model guidance and lack of a clear shift towards El Niño in the observational data. In summary, while chances are slightly lower than 50%, ENSO-neutral and El Niño are nearly equally favoured during the northern hemisphere summer and Fall 2017 (click CPC/IRI consensus forecast for the chance of each outcome for each 3-month period). Think you could have come up with a longer User ID? Looks like my home town (Houston) might be in for a rough weekend with Harvey. I am located 30 miles north downtown. We got flooded out with Allison but moved to 'much' higher ground after that. Will keep you posted. That storm has the potential to do some real damage. @Ocala, I see you are also getting lots of rain there in Florida. The WPC is showing roughly 10-15" as a forecast right now. The GFS is showing much higher, and boy, I hope it is wrong for you all in eastern Texas. Hopefully Harvey gets off the brakes when it makes landfall. I got wiped out with about 8" of rain in a valley (That's a 250 year flood for us). I can't imagine what 40" of rain would be like. WOW! I'll be getting direct reports most of family is now living suburbs of Houston. Know that area well...I lived just south of Spring at North Fwy and FM1960 for a couple of years before I moved back to Oklahoma. I lived there during the Andrew scare when the track of the storm wasn't exactly known after crushing southern Florida. Stay safe. Problem with those rain forecasts is that some of those rain gauges could be under 10 ft of water. This is shaping up to be a truly epic flood event. Just spoke to brother in Humble outside Houston. Not really worried but does have spare gas and water on hand just incase and was going to pickup a cheap rain gauge at walmart. Told him to get one that held the most rain possible and he still may need to dump it several times before it's over. I'll have him into getting a weather station soon. Jeez Randy, just have him pick up a CoCo gauge, but quickly. It's certainly something he'll keep when he gets his PWS, instead of a POS from Walmart. Probably need to order one. He told me he was going to put a bucket out in middle of yard so I mentioned the $3 dollar walmart gauges. I lived three years in the 90s fairly close to Humble (had a Houston address but lived just south of Spring) and when I did live there it was during the time we had the Andrew scare. The Galveston City Manager was excoriated for calling for an evacuation when nothing wound up happening. The forecasts had it coming right into High Island (just east of Galveston). The CM said he didn't care what people thought..he erred on the side of caution. I remember that week and the run on batteries, bottled water and flashlights as well as non-perishable food items. As a transplant, my then-wife and I had already made up a 'survival kit' so we were ready. It was essentially the same survival kit we made for tornado season in Oklahoma. On the bottled water thing. Why do people run out and buy it for preparations? I keep milk jugs and juice bottles and a few others in different sizes. I can fill those with tap water if I feel the need and have several gallons on hand in a matter of minutes. Less landfill waste too. Good idea, biggest problem brother mentioned is a few will hoard the shelves even gas stations run out which leaves others short on supplies. Best to have supplies ready at home and not rely on stores at last moment. He has 3000 watt generator also along with couple enduro motorcycles he claims is necessary if they actually needed to exit Houston because highways are impassable with gridlock. This is shaping up to be quite a storm. Certainly thinking of all the people in Texas now. Thoughts and prayers. This station is live for now, Rapid Fire from Aransas Pass, Tx. Semantics at this point, now a Cat 4. WOW on ABC news. Maybe scare tactics to make people leave. "We’re suggesting if people are going to stay here, mark their arm with a Sharpie pen with their name and Social Security number," Rockport Mayor Pro Tem Patrick Rios said at a news conference this morning. "We hate to talk about things like that," he said. "It's not something we like to do but it’s the reality, people don’t listen." So far, none event here, .18" rain. Looks like we are in for it Saturday, Sunday.